As the role of the pharmacist has shifted to a stronger focus on direct patient care, a comprehensive understanding of financial management, especially effective billing practices, is increasingly critical. In addition to clinical decision-making, pharmacists must take ownership of generating revenue, reducing waste, and creating sustainability. Proper billing ensures Centers for Medicare and Medicaid Services (CMS) compliance and drives cost management improvements. Serving 47 counties, OhioHealth is a large, not-for-profit health system comprising ten hospitals, infusion centers, free-standing emergency departments, urgent care centers, surgical centers, retail pharmacies, hospice, home health, and physician practices. With over 30,000 associates, physicians, and volunteers, OhioHealth has consistently won awards for excellence in clinical performance, achieving national industry benchmarks, and as a top-rated employer. In the ongoing pursuit of excellence, OhioHealth recently launched an initiative to increase financial integrity within pharmacy services. The pharmacy revenue integrity team at OhioHealth, created in 2014 within the pharmacy business services department, has grown from a single charge analyst at the outset to a broad team of pharmacists, charge analysts, and billing and medication assistance coordinators. The team works to bridge both clinical and pharmacy operations with system pharmacy business management. The team’s major functions include managing the pharmacy charge description master (CDM), charge and reimbursement analysis, system support for formulary decision-making, and providing prior authorization and medication assistance services for infusion services. We continue to explore integration with physician practices and home infusion services for opportunities to apply the revenue integrity best practices utilized within OhioHealth acute care hospitals. Our initial goals were to ensure integrity of the pharmacy CDM and pharmacy charges upon transition to a new electronic health record (EHR), which is a continuing focus for regional care site expansion. Regular collaboration with revenue cycle, finance, managed care, and EHR build teams produces compliant billing practices and results in complete, legitimate reimbursement for medications administered. To ensure health system support for a pharmacy revenue integrity team, it is important to demonstrate value at the outset by establishing integrity of charging, billing, and reimbursement. Proper CDM management is key to this pursuit. Outcomes should be measured and reported to demonstrate financial and value-based results; this will engender leadership support and enable future growth of the team. Pharmacists can serve in a crucial role within the revenue integrity team by effectively translating clinical and operational knowledge among diverse stakeholders. Within a highly matrixed health system, cross-functional leadership must establish strategic partnerships to support the team’s integration and guide collaboration for program success. The high cost of oncology and infusion drugs continues to be a significant concern for health-system pharmacies, payers, and patients. Studies show that billions of US health care dollars are spent on oncology therapies and related pharmaceutical waste, and with the growing utilization of targeted therapies, this expense is expected to increase.1 Robust pharmacy management can play a major role in decreasing pharmaceutical waste through utilization of best practices in procurement, product selection, dose-rounding, and careful preparation, thus reducing drug costs. In fact, these drug waste mitigation strategies have demonstrated annual savings of up to 17% of drug costs.2 In addition, outpatient care facilities, such as infusion centers and physician practices, are able to recoup some costs when waste is billed in compliance with CMS guidelines. In January 2017, CMS established a Healthcare Common Procedure Coding System (HCPCS) modifier, JW, which may be used to report and bill for eligible pharmaceutical waste associated with an outpatient administration.3,4 With the new reporting requirement, providers must identify waste charges separately from the administered dose on the claim using a JW modifier with the HCPCS code. Providers may be reimbursed at the same CMS rate as the pharmaceutical administered. Prior to this CMS change, some health care organizations charged for the whole medication vial used for a patient’s infusion or injection, encompassing the dose administered and any waste from the vial not used on another patient. Organizations that charge via this methodology may experience revenue and reimbursement loss and potentially greater challenges with JW modifier implementation. Alternately, organizations that only charge for the administered dose are expected to experience fewer challenges during implementation, and will likely experience an increase in revenue, reimbursement, and 340B accumulations as secondary benefits to achieving the CMS standard of waste reporting. The OhioHealth pharmacy revenue integrity team was well-positioned to lead the waste billing initiative due to the natural collaborations within corporate pharmacy services, bridging pharmacy business administration with pharmacy operations. The primary objective was to establish an enterprise-wide approach to achieve compliance with the CMS standard of reporting and to measure any additional downstream gross revenue, reimbursement, and 340B accumulations for applicable care sites. Project planning began in March 2017 with stakeholder meetings to promote collaboration and to ensure a smooth implementation. Key stakeholders included the pharmacy and billing EHR build teams, compliance, procurement, oncology pharmacists, pharmacy site managers, and lead pharmacy technicians. Planning began with an investigation of EHR functionality for waste documentation and charging with consideration of CMS requirements. The scope, stakeholder responsibilities, projected timeline, and measurements for success were outlined and presented to stakeholder leadership for support and prioritization. Performing a drug selection analysis prevented unnecessary build and allowed us to focus only on pertinent drugs that would produce waste charges. Stakeholders made the decision to proceed with a pilot consisting of one high-volume infusion drug across nine hospital and infusion sites, then to phase in all remaining eligible drugs 3 months later to allow for claim monitoring and operational workflow adjustments (see FIGURE 1). Following the planning stage, a gap analysis was undertaken to ensure all compliance measures could be met. The gap analysis was critical to the early success of the project as it ensured that best practices were established prior to implementation of waste billing. OhioHealth has clinical dosing policies in place that outline specific pharmacist-initiated or EHR-automated dose rounding. Drug dose rounding is an excellent example of how OhioHealth Pharmacy Services strives for value-based care. For example, a weight-based infusion dose that is within 5% of a vial size for a drug within the policy could be rounded down without clinical significance, facilitating cost savings for the health system, patients, and payers, and providing value in therapy management. The clinical dosing policies were reviewed to ensure they were comprehensive. Through medication dose reporting, care sites were identified that demonstrated opportunities for improving consistency and utilization of dose rounding, and additional education was provided. EHR product selection logic was optimized where possible to identify the smallest or most appropriate combination of vial sizes. The process of waste documentation was assessed in testing with care site input to minimize operational impact to the staff. Compliance reporting, managed by the pharmacy revenue integrity team, was established for daily monitoring purposes. We also reviewed inventory and vial size availability with technicians and medication sourcing administrators to ensure compliance. The pharmacy staff, including site and operations managers, infusion pharmacists, technicians, and medication sourcing administrators, were taught waste documentation workflow using quick reference sheets specific to the EHR functionality utilized for the care site. Webinar training sessions were used to review the new workflow, which facilitated discussion and interactive learning. Staff education focused on CMS requirements and a review of best practices, including appropriate vial selection when compounding to produce the least waste, operational considerations with non-stock formulary purchasing, and technician workflow changes for waste documentation. By September 2017, the pilot was initiated across nine hospital infusion sites with a single drug, bevacizumab. By mid-January 2018, half of the eligible drugs had been phased-in, and by mid-February, all remaining eligible drugs (as determined by the aforementioned drug selection process) were incorporated. The pharmacy revenue integrity team continues to monitor all hospital and infusion charges for these waste-eligible drugs to identify any missed waste documentation, track compliance in terms of vial size used, and ensure waste charges are applied only for outpatients. In addition to compliance, the team also monitors the financial impact that results from appropriate coding, billing, unit-rounding, and charges management. Measures of success include tracking the number of compliance errors (which are then corrected prior to billing) and establishing the financial impact. In addition, 340B accumulations are audited for accuracy and compliance at applicable care sites. A compliance analysis confirmed that the documentation functionality produced compliant billing in accordance with CMS regulations. Financial impact by care site is monitored by gross revenue. The pilot’s gross revenue equated to $229,533 across nine care sites. 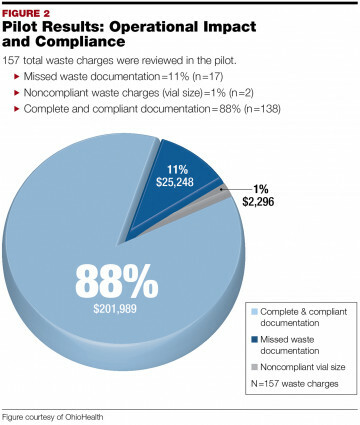 Furthermore, operational impact was assessed and determined to be minimal, as there were 17 cases of missed waste documentation (and therefore missed charges) out of 157 waste charges (see FIGURE 2). Only two noncompliant waste charges occurred, and those were corrected prior to billing. The pharmacy revenue integrity team was concerned about the potential impact that billing pharmaceutical waste would have on patient copays or coinsurance. Therefore, we carefully considered the potential patient impact in the planning stage by auditing insurance remittance. Separately reimbursed drugs, eligible for waste billing, are typically expensive outpatient chemotherapy infusions. Almost all of these patients had either commercial coverage, supplemental Medicare coverage, or financial assistance of some form to cover their medical and infusion expenses. As expected, upon retrospective review performed during the pilot, we found that many of these patients already had met deductibles and maximum out-of-pocket amounts by the time a pharmaceutical waste charge resulted. Patients typically had a zero-dollar copay or coinsurance associated with the pharmaceutical waste; however, we were able to obtain reimbursement from Medicare and commercial payers, allowing hospital pharmacies to recoup drug costs of expensive pharmaceuticals that were an unavoidable result of a patient’s infusion therapy. Since this waste initiative’s principal goal was to achieve the CMS standard of reporting for pharmaceutical waste, with minimal impact to the patient, it was determined that the initiative was successful and would continue. When establishing a pharmaceutical waste billing program, the first challenge to overcome is connecting pharmacy operations, EHR build teams, and revenue cycle billing to ensure that the implementation is compliant and successful. Since this project was led by the OhioHealth pharmacy revenue integrity team, which had previously established relationships with stakeholders, this process was easy to manage. In addition, early stakeholder collaboration and leadership support was helpful in guiding implementation and prioritization of the initiative. The drug selection process performed in the planning stage was challenging and tedious, but nevertheless, critical, as it reduced unnecessary EHR build. This process required the input of a pharmacist with clinical expertise as well as an understanding of coding and billing. For pharmacy departments without this in-house expertise, drug selection can be accomplished through collaboration between revenue cycle teams and a pharmacist. Failure to Document Waste. Some staff members initially forgot to document waste during preparation of the infusion. This has greatly improved with the addition of a reminder to document waste, which appears on the pharmacy preparation label instructions and the vial storage bin reminders in the form of custom stickers stating: DOCUMENT WASTE. Improving Communication. Within a large health system, clear communication and mechanisms for feedback regarding operational impact should be part of any new workflow adoption. Just-in-time reminders, reference tools, and taking the time to educate staff on the reasons behind the change are key to a successful implementation. Managing Multiple EHRs. Taking a system approach to implementation, which required working with multiple EHRs with differing functionalities, complicated the project. Leadership support for system implementation was imperative to ensure the necessary technical resources were allocated and prioritized in order to support simultaneous implementations. Effective financial management plays an important role in minimizing pharmaceutical drug waste to achieve the CMS reporting standards. Maximizing revenue, payer reimbursement, and 340B drug cost savings can significantly impact efforts to recoup drug costs for hospital-based pharmacies, and potentially for physician practices. However, it is critical to note that extensive planning and stakeholder collaboration are critical in developing a successful foundation for any system-wide financial initiative. In addition, continual monitoring and operational modifications are necessary to support compliance and operational success. Future plans for the waste billing initiative include consideration of new formulary additions, when eligible, to utilize waste billing practices. Ultimately, pharmacy revenue integrity system initiatives, such as the waste billing initiative, require pharmacy and system leadership support to ensure ongoing success. Catherine G. Collins, PharmD, MHA, is a pharmacy revenue integrity coordinator at OhioHealth, and serves in a leading role on the pharmacy revenue integrity team. She received her Doctor of Pharmacy from the University of Florida and her Master of Healthcare Administration from Franklin University. Prior to her current role as special projects director—transformation and strategy, Tara Hanuscak served as business director of pharmacy services at OhioHealth where she led the team supporting pharmacy business functions across the organization. In 2008 and 2013, she was recognized with the OhioHealth Prism Award for Stewardship, the highest level of recognition for associates who reflect the organization’s mission and values. Tara received her Master of Science in health-system pharmacy administration and Doctorate of Pharmacy from The Ohio State University. Girish Dighe, PharmD, MS, is the director of pharmacy business services at OhioHealth. He earned his Doctor of Pharmacy degree from Campbell University College of Pharmacy and Health Sciences in North Carolina, and a Master of Science in Health System Pharmacy Administration at The Ohio State University, with combined residency training at OhioHealth Riverside Methodist Hospital in Columbus, Ohio. In his current role, Girish oversees revenue integrity, informatics/business intelligence, and procurement for pharmacy services across the enterprise. Meropol NJ, et al. J Clin Oncol. 2007;25(2):180-186. Leung CYW, et al. J Oncol Pract. 2017;13(7): e646-e652. Centers for Medicare and Medicaid Services. Medicare Claims Processing Manual Chapter 17-Drugs and Biologicals (August 26, 2016). www.cms.gov/Regulations-and-Guidance/Guidance/Manuals/downloads/clm104c17.pdf. Accessed November 2, 2018. Centers for Medicare and Medicaid Services. Medicare Program JW Modifier: Drug/Biological Amount Discarded/Not Administered To Any Patient Frequently Asked Questions (August 26, 2016). www.cms.gov/Medicare/Medicare-Fee-for-Service-Payment/HospitalOutpatientPPS/Downloads/JW-Modifier-FAQs.pdf. Accessed November 2, 2018. CMS Pushes Modifier JW Requirement to 2017. Revenue Cycle Advisor. https://revenuecycleadvisor.com/news-analysis/cms-pushes-modifier-jw-requirement-2017. Accessed November 2, 2018.